I posted before that Daniel would be a guest voice on Robot Chicken in this new 6th season. Yesterday was the air date of episode 9 called Hemlock, Gin and Juice on Adult Swim (at midnight) in which Daniel was the guest voice actor. 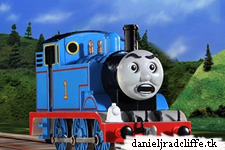 So I guess you all know what the answer is now: Daniel provided the voice for Mullet kid and Thomas the Tank Engine. If you missed the episode you can view Daniel's part below.